It’s a little past daybreak on Saturday, October 22, 2011. Our tiny squadron is at risk of becoming separated above the forests of Arkansas. “I’m passing over the lookout tower turning west,” announces lead pilot Robert “Taz Man” Walker from the seat of his flying machine. “Copy that. We’re almost over Lake Fort Smith,” I reply. Supported by wings of Dacron and rigid aluminum tubing, fellow trike pilot Elijah Tate and I search for Taz Man’s powered parachute above Mt. Gaylor. In a tortoise-and-hare blunder, we set out too casually behind Taz’s green canopy during the fall fly-in at Byrd’s. Counting on our motorized hang gliders to be faster than his billowing parachute, we took a less direct route than our leader. Now we’ve fallen behind and communications are spotty. We’re struggling to catch up on today’s 80-mile roundtrip flight to Fayetteville. Even further behind is Martin Rollinson, the fourth member of our team. Immune to urgency, he is busy leaf-looking in his powered parachute near the foot of White Rock Mountain. “I’m right behind you guys,” he promises. “Roger.” I too get lost in the autumn sights while chasing Taz over the highlands. The folds of Hurricane Creek appear a thousand feet beneath our wings. Somewhere below passes a forgotten landmark from Gerstacker’s book, Wild Sports in the Far West. On one of these mountains lies the resting place of an English hunter named “Erskine,” killed in 1841 while fighting a bear with his Bowie knife. Elijah and I proceed beyond the fallen hunter without incident. In the distance we see iron rails linking the mountain towns of Chester, Mountainburg, and Winslow. The workers who blasted this railway into existence in the 1880’s surely told stories of tribulation and triumph. Too bad so much history fades with the seasons. “I’m almost over Drake Field,” Taz announces half an hour later, breaking my fascination with the landscape. “I told the tower you’re coming and will stay west of the airport,” he continues, still miles ahead of our trikes in his powered parachute. We plan to skirt Drake’s Class D airspace and land at our friend Tony Hardin’s grass strip on the outskirts of Fayetteville. Slipping off the quiet Ozarks onto the Springfield Plateau, we stare down at the urban leg of our mission. Taz lands victoriously at Tony’s fifteen minutes before Elijah and I arrive. The strip sits in view of the University of Arkansas and Razorback Stadium. Fayetteville is bustling on this perfect autumn morning and Tony himself is out enjoying the skies in his powered parachute. Winds are calm when my wheels roll up next to the windsock at Tony’s airfield. Elijah rolls in moments later under his red and white machine. We taxi over and park next to Taz’s spotless Pegasus, which he wipes down wearing the grin of a champion. Only one member of our party, Martin, has yet to arrive at Tony’s in-town strip. We notice Tony circling above the mountains south of town while scanning for Martin to appear from the same direction. Sightseers in a yellow Cub and blue Maule fly overhead in the clear sky. Several of Tony’s buddies drive up for a visit. I’m at a loss when one of them asks the unanswerable question: “Which is better, trikes or powered parachutes?” My intrepid friends Taz and Martin consistently disprove the notion that powered parachutes do not handle cross-country flying as well as trikes. I finally blurt a few words about the advantages of each. One of the visitors, Frank Goodnight, decides he wants to join us with his fixed-wing Kolb for the return flight to Byrd’s. He rushes off to get his airplane at Drake Field. “I have a visual on you,” I announce to Martin as his multicolored canopy swells against the southern mountains. He easily locates the only field with two trikes and one powered parachute while I offer unneeded assistance. Taz likewise provides useless hand-and-body gestures as Martin makes an impressive 180 and lights next our machines. The Byrd’s flock has finished migrating to Tony’s. Martin, Elijah, Taz and I regroup while Tony continues buzzing with glee in the background. The plan for our return is to thread the needle between Fayetteville and Springdale airspaces on an eastbound heading. Once over Lake Sequoya, we’ll fly up the headwaters of the White River and hop over Hare Mountain along the journey back to Byrd’s. The business of our adventure lies ahead and only one of us has made the trip before. Winds are picking up and the group is eager to get going. Taz takes off first and Martin quickly follows. I lift off next and watch Elijah become airborne moments later. We’re in loose formation flying east when I notice an extra aircraft: It’s Frank Goodnight in his Kolb! Spirits are high as our growing armada makes way on a homebound course. At Lake Sequoia we leave behind the hustle of Fayetteville. Once again we admire the hidden wonders of the Ozarks. Hillside farms and winding streams appear beneath us. Limestone bluffs peek from forests of hardwood. As we travel the mountains grow in size. So do the winds. Two trikes, two powered parachutes, and one fixed wing are doing a fine job of staying together and managing differing airspeeds over the White River. As always, the determined Taz Man is far in the lead. Martin happily hangs back with his larger and slower canopy. The rest of us fill the widening gap by making passes over the countryside. My Redback trike is not as fast as Elijah’s Alaska-ready Antares. The fixed-wing Kolb Firestar is the fastest machine in our fleet, but Frank is skillful at flying with slower aircraft. Taz and Martin are using variable altitudes to optimize the swiftness of their canopies. It’s interesting flying, to say the least. As we make headway the winds become stronger and threaten to deter our fleet. Unsettling bailout options include returning to Fayetteville or landing on some backwoods back forty. A few transmissions confirm all pilots are okay, but sightseeing needs to be cut short in favor of getting home. At the settlement of Combs we say goodbye to the White River and climb above 4,000 feet, making a beeline for Byrd’s. Hare Mountain passes below as we endure increasingly bumpy air. We cross the high Ozark divide and our destination comes in view. Descending into the Mulberry Valley, I watch each pilot settle on the riverside airstrip at Byrd’s. Mid-day conditions are less than perfect when it’s my turn, but I manage a trouble-free touchdown. With everyone safe we taxi our machines to a relaxing afternoon in camp. Winds become calm late in the day and the five of us fill the skies above Byrd’s again. Frank says goodbye and ventures back to Fayetteville, promising to return with friends next time. The rest of us enjoy watching the sunset over the autumn slopes. 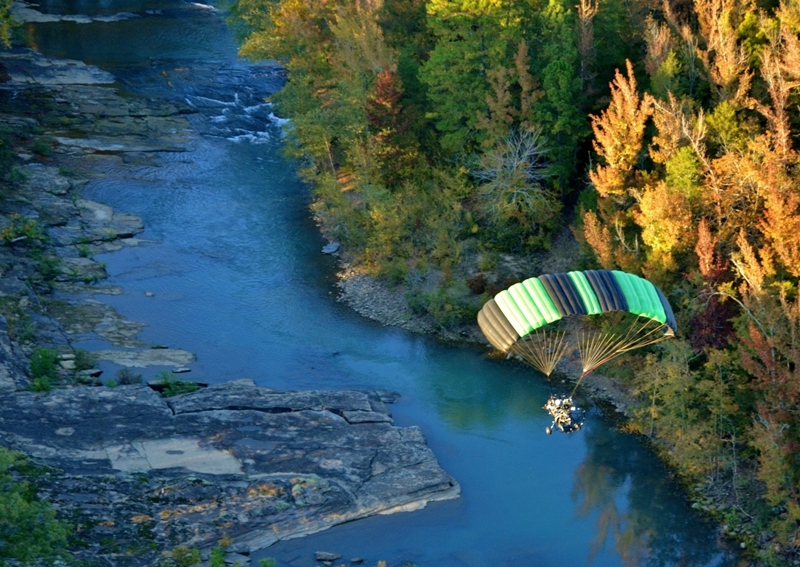 “Best fly-in ever!” announces Taz from high above the Mulberry River.